This is the Breva Génie 02 Terre which uses a variation of the same Chronode produced movement used in the Breva Génie 01 (which was launched last year). 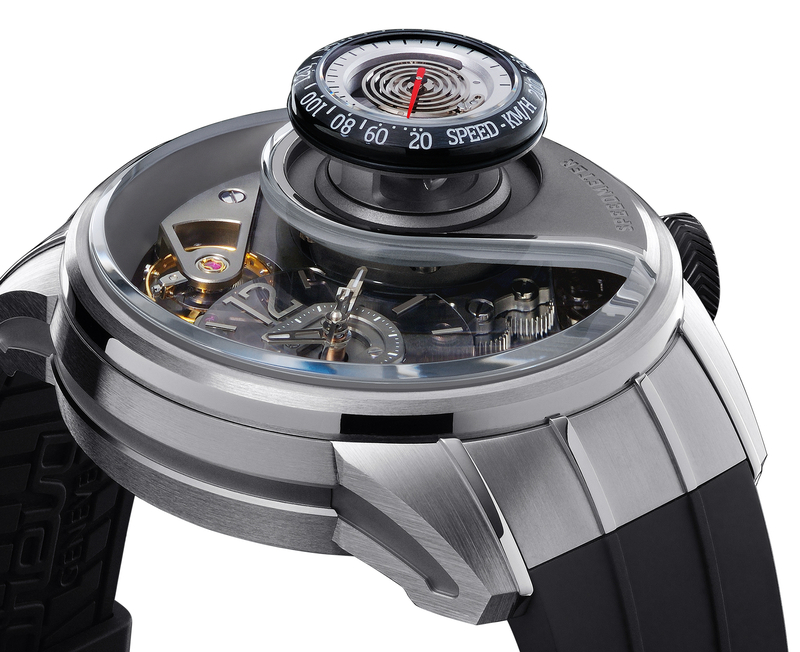 The new functionality, and the highlight of the second Génie — is its precision barometric altimeter. 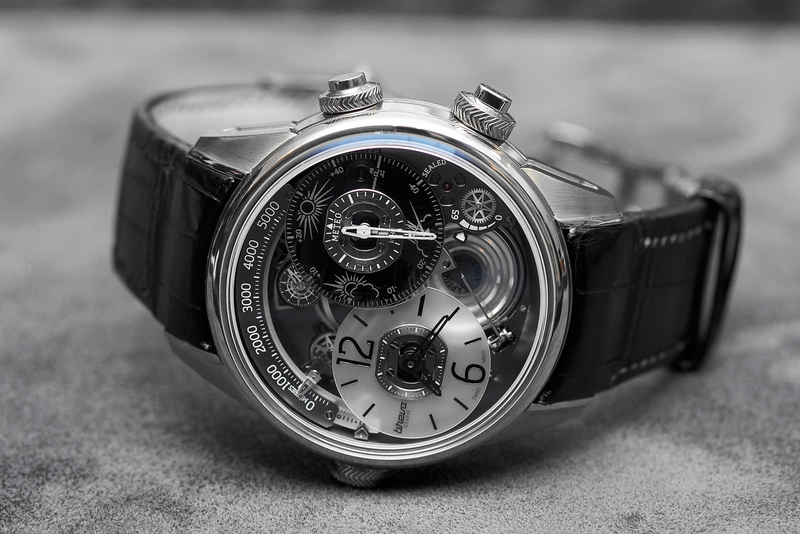 Designed by Jean-François Mojon of Chronode, the movement has 415 components (45 of which are jewels) and it runs at 3Hz, with a 65-hour power reserve. Functions of the Génie 02 include: hours, minutes, small seconds, large-scale altitude indicator, precision-scale altitude indicator, power reserve indicator, air pressure valve, equalizer seal indicator, altitude scale adjuster. Time is displayed (hour and minutes) at 8 o’clock. At 4 o’clock, seconds and power reserve are displayed. Also at 4 o’clock, is an indicator that shows if the air valve is open or closed (it has to be open to indicate the altitude). At 2 o’clock, the big sub-dial is a precision altimeter (in meters or feet, depending which one is purchased). The display, within the altimeter, shows air press in hectopascals (hPa). Arcing around the top of the dial is the large-scale altitude indicator, which displays up to 5,000 meters (or 16,400 feet). At 12 o’clock is the small seconds. At the bottom of the dial you can see one of the two aneroid capsules measuring air pressure (from which the altitude is calculated), with a high-precision arm multiplying by 200 times the expansion and contraction of the capsules and relaying the air pressure to the two altitude indications. The timepiece reliability is maximized by using an osmotic Teflon membrane that filters any moisture and humidity from any air before it enters the movement. 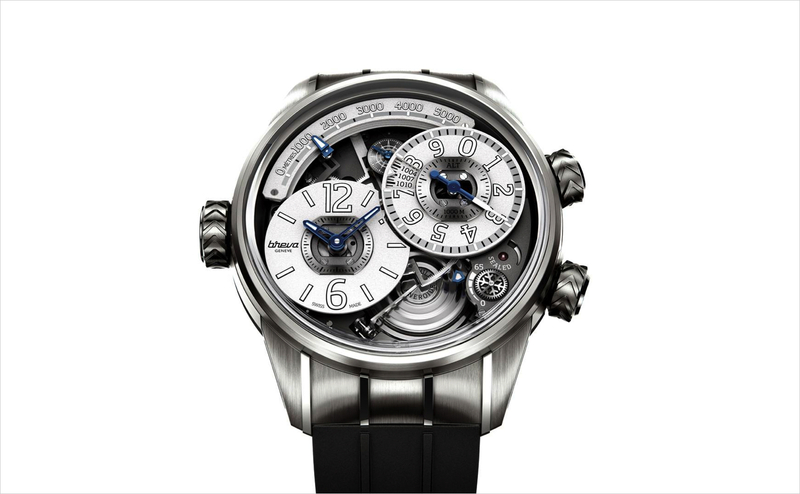 Three chevron-engraved crowns wind, set, adjust and operate the functions of Génie. Just above the crown, a white indicator on the dial marked ‘SEALED’ warns when the valve is unlocked. 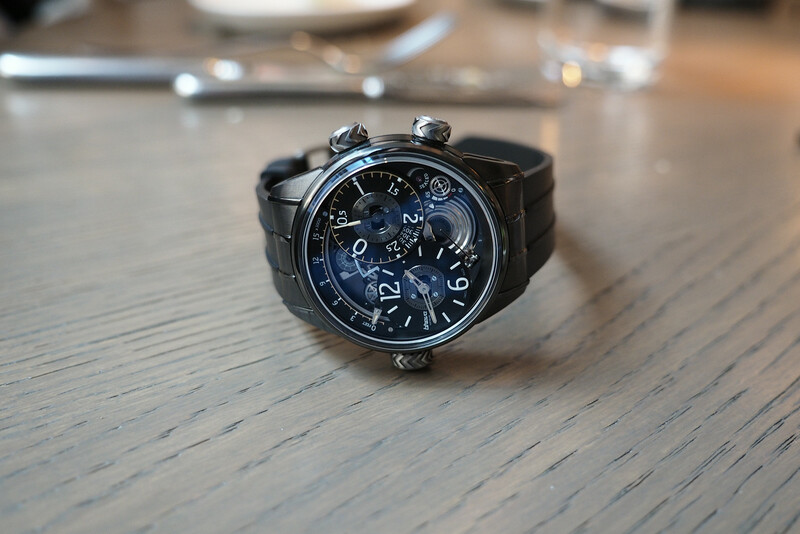 The Genie 02 Terre has a 44.7 mm diameter X 15.7 mm case in grade 5 titanium. Water-resistance is 30 meters. It comes on a natural rubber strap with titanium buckle and is limited to 55 pieces. (Available with either meter or feet calibrations.) Retail is $132,000. Next articleHamiltonHamilton Khaki Field Titanium Automatic in "Jack Ryan: Shadow Recruit"